Prime Minister Sheikh Hasina paid rich tributes to Father of the Nation Bangabandhu Sheikh Mujibur Rahman this morning on the occasion of the 49th Independence and National Day. 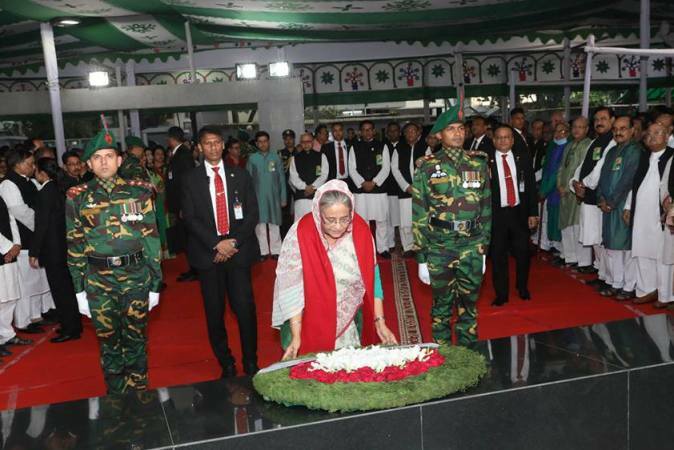 After placing the wreath, she stood in solemn silence for some time as a mark of profound respect to the memory of Bangabandhu, the architect of the independence. Flanked by central leaders of the party, Sheikh Hasina, also the president of Bangladesh Awami League, laid another wreath at the portrait of Bangabandhu on behalf of her party, report BSS.